Gel Cube Memo Clip With Logo from the stationery department here at Calendar Lady Promotions is a very handy and practical little promotional item that will not only look good, but when it's printed up with your business details and company logo it becomes the perfect advertising tool. So help to promote your business details and company logo by having your details printed upon our Cobra Memo Clip With Logo today! To find out more about our Gel Cube Memo Clip With Logo click here and fill in the contact form and we'll get straight back to you. 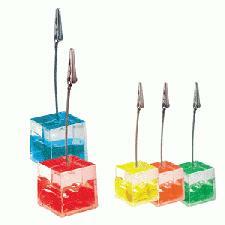 Other promotional and personalised items besides our Gel Cube Memo Clip With Logo click here.